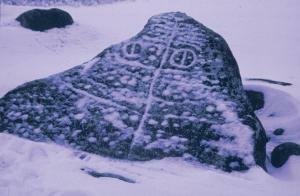 The largest of three Herschel petroglyph boulders, about 2.2 m wide. Traditional Aboriginal arts have had a long and rich history in Saskatchewan. From rock art to clothing, ceremonial items, and utilitarian goods, traditional Aboriginal arts display a high level of artistry and technical adaptation to Saskatchewan geography and climate. Almost every object traditionally used by First Nations groups in Saskatchewan was decorated; the amount and type of decoration remained an important factor in determining the object’s functional, ceremonial, or trade value. The five main tribal groups in this province—Cree, Dakota, Dene, Nakota, and Saulteaux—established a rich artistic history that continues today. Large numbers of Saskatchewan Aboriginal artists continue to produce traditional arts. Lorraine Bear making a traditional Cree dress, February 1987. Rock art helps fathom the long history of traditional Aboriginal art in the province. Evidence of rock art can be found throughout Saskatchewan in the form of petroglyphs, medicine wheels, pictographs, and effigies. However, most objects of art were portable and made from organic materials. Often the expression of individual identity and achievement was conveyed through one’s adornments. Men, women, and Children were beautifully dressed and adorned with amulets, feathers, and other important items. Designs were painted, quilled and, after contact, beaded onto clothing to express meanings. Both men and women helped create ceremonial clothing; today, that ornate tradition is continued through the designing of powwow regalia. In the past, Aboriginal women’s artistry was often organized communally within women’s artistic guilds. Large-scale tasks such as the making and raising of a tipi required the full orchestration of the group, with specialists performing particular tasks. 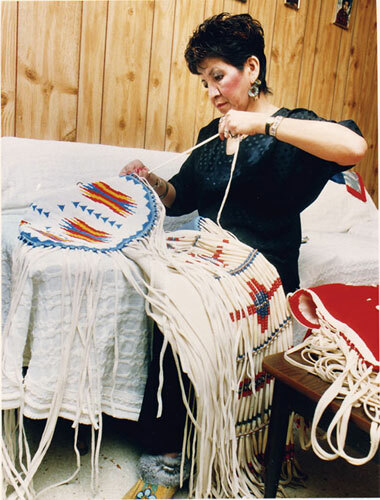 Quillwork is a sacred art among plains First Nation’s women, and the exchange of women’s quillwork was central to maintaining relations with neighbouring groups. With the introduction of glass beads, beadwork also became an important art form for women. On the prairie, men’s arts were connected to the creation of narrative scenes on buffalo-hide robes and tipis. These scenes memorialized a man’s exploits in war, success in hunting, or depicted images from dreams and visions. Winter counts—records of the most important events of a year—were also important images recorded by men. This style of painting was flat and semi-abstract; during the 19th century the contemporary art form, ledger art, emerged from this tradition. Sculpture has a long history as one of the traditional Aboriginal art forms. War clubs carved from wood and antler, pipes carved out of soft stone, and spoons and bowls made from wood or bent horn are all part of this artistic tradition. Perhaps best known are the horse effigies that were carried in dance performances. Traditional decorative designs used by First Nations groups were abstract and geometric as well as realistic. Floral designs, favoured by European traders, became more popular in the north because of earlier contacts; these designs were adopted and adapted mainly by Cree and Saulteaux artists in Saskatchewan. After contact, designs, materials, and techniques changed: beads and manufactured cloth were added to the traditional artistic materials, and European styles and designs were incorporated with traditional ones. After 1900, stylistic differences between First Nations in the province became less noticeable as traditional arts became more standardized owing to market demands for First Nations arts. Berlo, J.C., and R.B. Phillips. 1998. Native North American Art. London: Oxford University Press; Boyer, B. 1975. 100 Years of Saskatchewan Indian Art. Regina: Mackenzie Art Gallery.